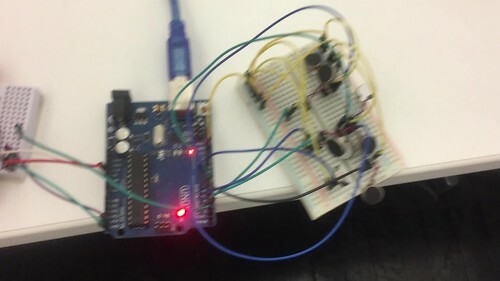 For Week 4 of my Cyborg Futures class, I decided to make a prototype of a cybernetic sense. In a few previous classes, our team Radiation has brainstormed the attributes that make up a sense. And of these, the most important attributes is the input and the output of a sense. An external physical occurrence which in some forms gets translated through the space/time dimension, whether it is a chemical, physical, atomic, or electromagnetic occurrence. The external physical occurrence is somehow intercepted and perceived by a sense. The perception of an external phenomena gets translated into information that can be cognitively perceived. The input is what can be considered the “reaction” caused from an external stimuli. Such a reaction can either be chemical, physical, electromagnetic, and temperature. When a reaction happens (1), it is somehow sensed (2) and then gets translated into a sensational output that can be understood by a cognitive system (3). This is where the sense interfaces with the brain through a way of communication that the brain knows how to interpret. A diagram about what is being said except that everything beyond perception is irrelevant for now. René Descartes’s (1596 – 1650) diagram of the mind/body dualism where sensory inputs are passed on by the sensory organs to the epiphysis in the brain and from there to the immaterial spirit (or the brain in non-philosophic terms). As mentioned in my last week’s blog I was particularly inspired by David Eagleman’s TED talk called “Can We Create new Senses for Humans? for reasons that I explain in that blog. But I decided to go forward and build a sense from the parts I ordered. I built a device consisting of an Arduino Uno microcontroller, 6-8 flat vibration motors, and a tilt sensor. A tilt sensor was used purely for demonstration purposes but the intention is to replace this sensor with something that relates more to the notion of radiation and the electromagnetic spectrum. The input and output is demonstrated with this particular example. 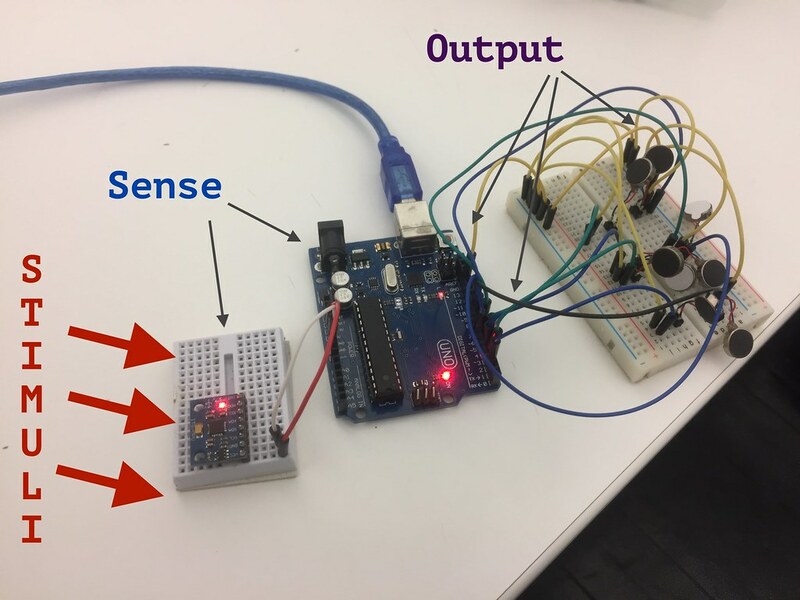 The input sense here is the tilt sensor, what it does is translates external stimuli into signals outputted by the vibration motors that can then be interpreted by the brain. From David Eagleman’s TED talk, these vibration can be paced one a person’s skin, and after some time, it will become capable of sensing whatever the input is capable of reacting too. In this case, it is a tilt sensor but can theoretically be any type of sensor. The input (the tilt sensor) is completely interchangeable.